Every SaaS company pours mountains of resources into building a sales team, creating efficient sales processes, and optimizing sales emails. That’s because the most direct way to impact your revenues is by making sure your sales processes are as tight as possible. But, how can you be sure you use the most effective methods to follow up with leads and close more deals? In partnership with PersistIQ, we analyzed the complete sales cadences of 281 SaaS companies, from intro to break-up. That included signing up for a whole heap of free trials, and then collecting over 1,000 emails and voicemail transcriptions. If you want to get proven insights from some of the world’s best SaaS sales teams, build your ideal sales sequence and learn to write emails that close deals, then check out Inside SaaS Sales. Inside SaaS Sales is a microsite we launched that collects and organizes every single piece of sales communication we received. It’s all there for you to browse through, swipe, and analyze. With such a lot of data, it’d be silly not to study it to find out the key trends and share that knowledge with you. So, keep reading for our full analysis of the data! What does an average sales cadence look like? On average, sales teams will follow up with a lead for 9 days before giving up, and send one email every day. That’s around 2 business weeks of daily contact. 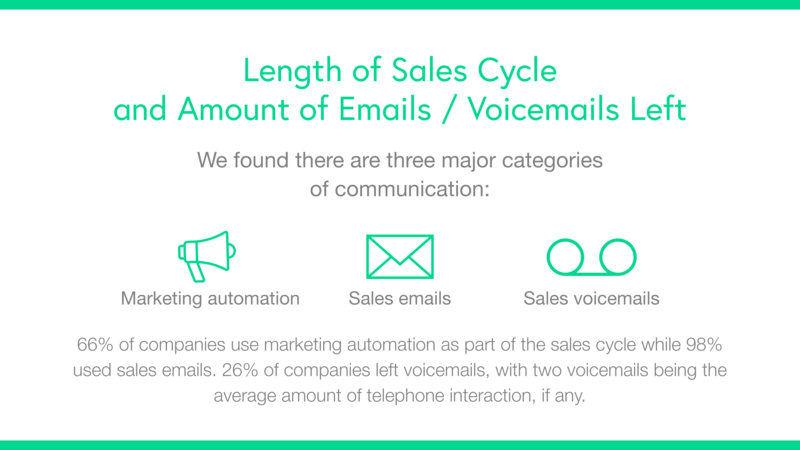 Companies like Epicor who left regular voicemails have sales cadences 160% longer on average, presumably because they take a more ‘high-touch’ approach with less automation. For 74% of companies, phone calls aren’t even part of the process, making it possible for these companies to fully automate the lead nurturing process and save time by not following up manually with leads that don’t respond. 37% of companies made only one touchpoint (email or voicemail) upon sign-up, while 40% made between 3 and 10. The most persistent companies made up only 23% of the set, sending anywhere between 11 and 36 emails and voicemails in a month. 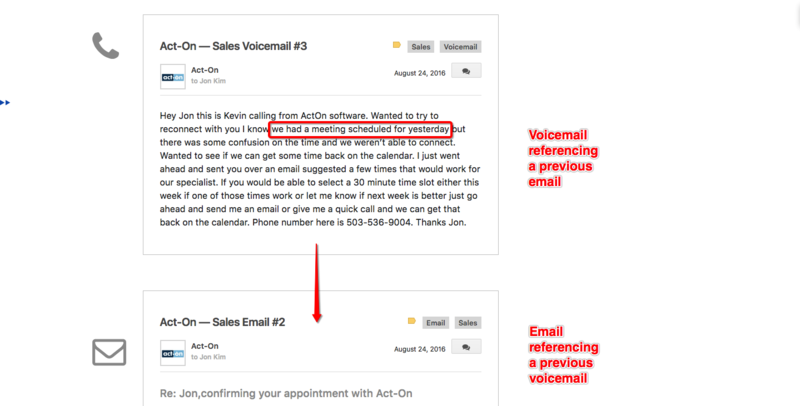 A common pattern we found was the trend of sending an email and then leaving a voicemail soon after asking if the lead has seen it. Making reference to an email or some other communication gives the salesperson a better reason to call. HubSpot calls this ‘opening with context’ in their guide to writing sales emails. They recommend this as a winning strategy, and give the example of a salesperson making a call to a lead right after emailing with reference to the email they just sent. Communication with context automatically feels more genuine and friendly than pushy repetition with the same messaging. 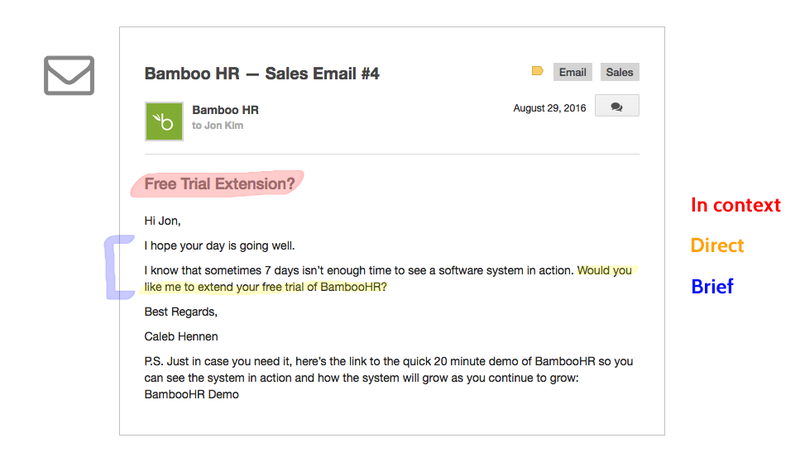 Manually sending emails allows you to add more personalization that could help to persuade, but can be very inefficient at scale. For that reason, 65% of companies hand leads off to an automated marketing campaign and 39% of companies send only automated emails. 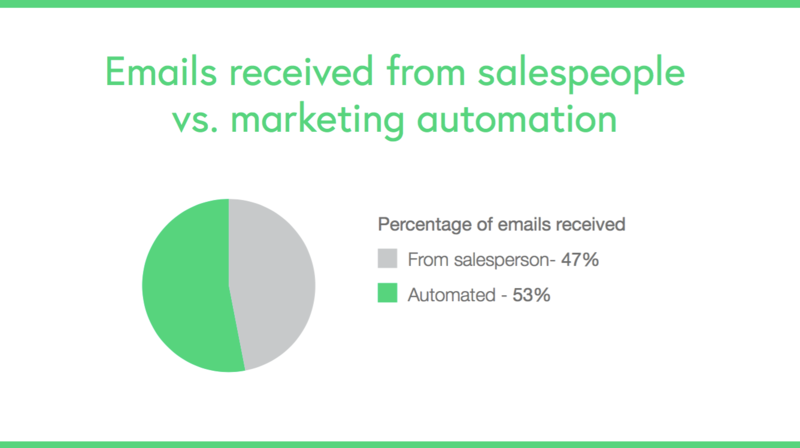 Overall, just under half of the total communications were from a human, with 53% of emails being automated. This is because almost two thirds of companies subscribe you to their marketing drip campaigns when you sign up for a demo or a free trial. These campaigns can be used to invite the lead to webinars and send helpful resources as they progress through their trial. 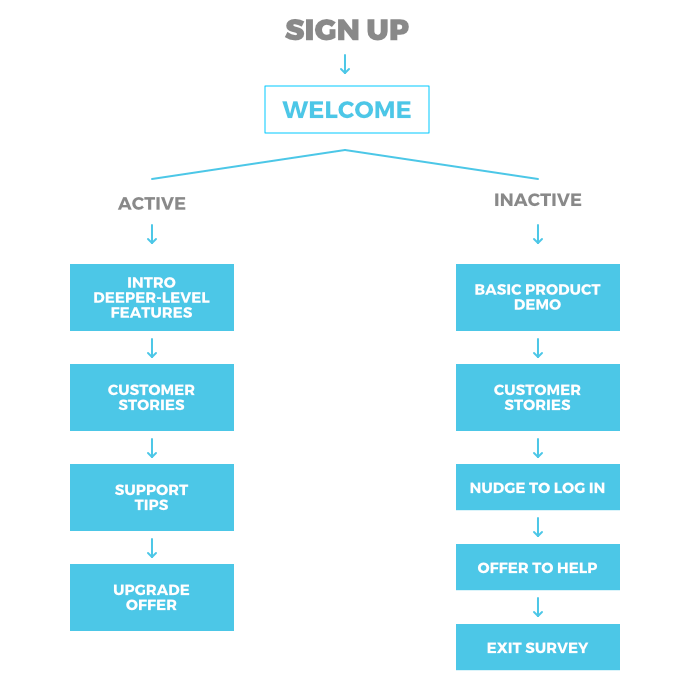 In this post, Groove breaks down their automated onboarding sequence, which is presumably something that runs alongside their manual sales communications. You can see this same pattern in the cadences of Intacct (here), BigCommerce (here), and AppDynamics (here). In our study, we found that the average length of an automated campaign is 3 emails. Collecting sales emails doesn’t just give you information on the content and frequency, it also provides insight into the number of people involved in the process of following up with one lead, and those people’s job title and role. 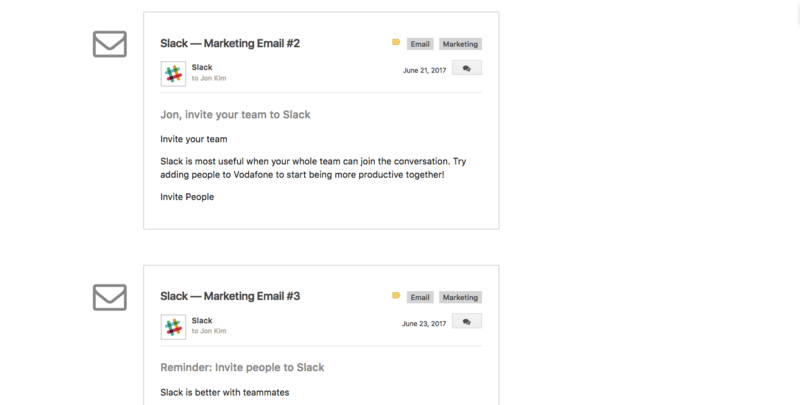 We found that on average, sales teams assign two contacts to a lead. 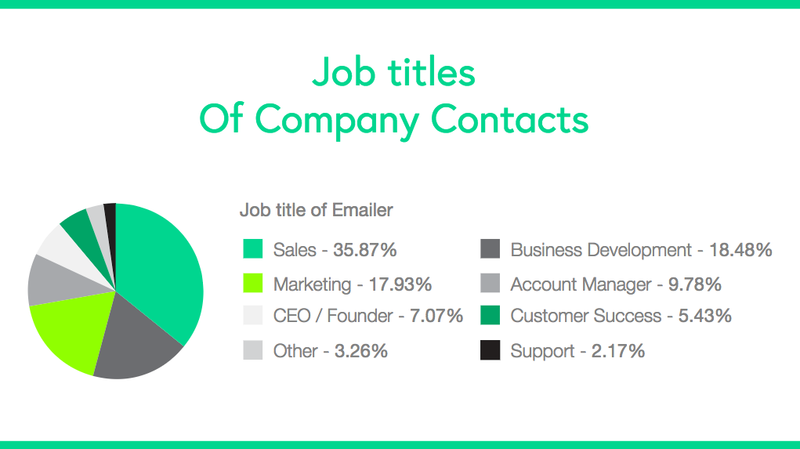 Predictably, the majority of the first points of contact have ‘sales’ in their job titles. However, for smaller companies it’s not uncommon for the CEO to reach out (or at least sign off on part of an automated sales follow-up campaign). Almost two thirds of companies in this study use some level of marketing automation in their sales processes, and the tools they used varied wildly. 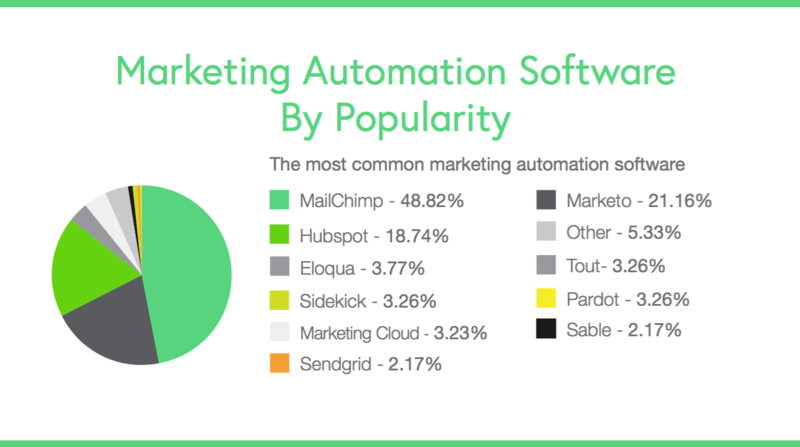 MailChimp is the go-to marketing automation tool for 48% of the companies, but the prevalence of HubSpot and Salesforce’s Marketing Cloud gives us an extra insight into which CRMs SaaS companies are likely using, also. The email also doesn’t assume the lead has been following the content so far, and drops another link to their demo call to action in the P.S. A ‘re:’ is often used to make the recipient believe they’re receiving something they’ve already replied to. Since, in this study, we didn’t send any replies, all ‘re:’s are false. And it’s true. The SaaS companies in this study serve big and small companies alike, but the enterprise B2B tools are the ones that use mostly webinars. This includes Datanyze (costs several thousand dollars per year at least), Apprenda (doesn’t show pricing on the site), and Cloudability (enterprise-targeted). Webinars are both a way to educate leads on why they need your product, and a way to show them how to use it. Reportedly, webinars also get a good engagement rate: marketer Jeff Molander writes that 94% of his webinar attendants stay until the end, and his most successful webinar had a close rate of 29%. A study by ReadyTalk found that 50% of registrants end up attending webinars, and that the average webinar had around 260 registrants. The engaging format and high conversion rates make webinars the 2nd best content for ROI. Using the details of a fictional Vodafone employee, we signed up to SaaS companies from the Montclare SaaS 250, and the top startups on AngelList. While no follow-up effort from our side was made, we tracked and archived all voicemail and email activity to build a set of over 2,000 data points. To collect the emails, we connected Gmail up to Google Sheets via Zapier, and fed each part of the email (from address, subject line, body text, etc.) into its own column. The voicemails were captured and transcribed by Grasshopper, which emailed computer-generated transcriptions to the same address. We tided and formatted the data in Google Sheets, TextWrangler (for lots of grep searches! ), and Airtable. 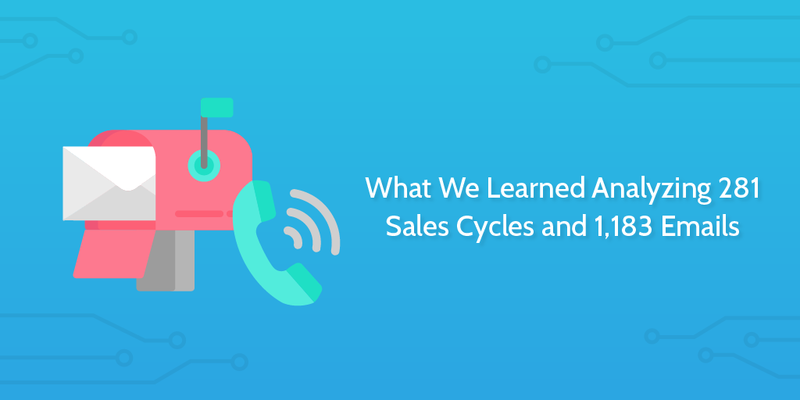 To browse the full sales cycles of 281 SaaS companies and learn from the top salespeople, visit Inside SaaS Sales, our huge archive of sales communication.